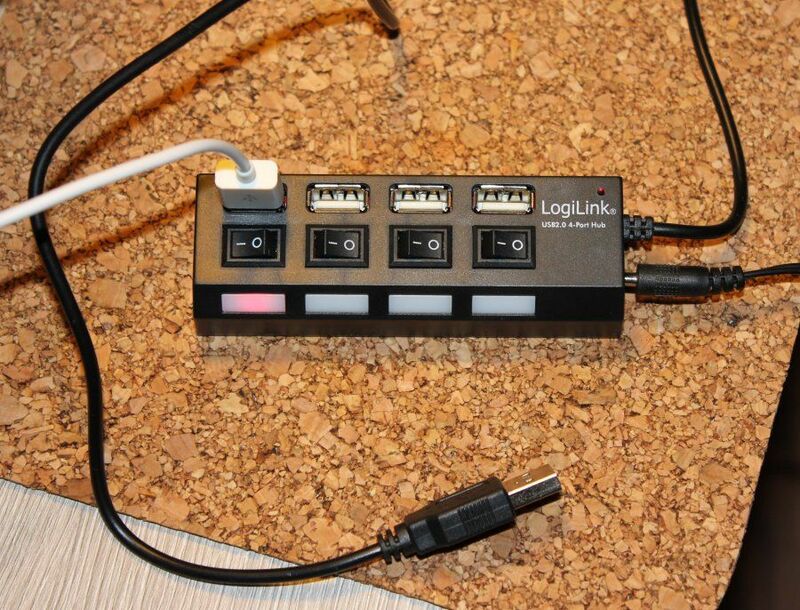 LogiLink UA0128 is an active USB2 HUB, and as such it comes with a power adapter (5V 2A) that can power USB devices connected to it. It provides for USB2 ports with power switches allowing turning them on and off. On logilink webpage you can find some detailed informations. The documentation that came with the HUB mentions even that it's possible to connect around 128 devices (probably through some insane daisy-chain of HUBs). Similar looking HUBs are available under other brands (as it's quite likely typical branding of China mass made item). Active USB HUB is handy when the computer can't provide enough power to the connected device. Some netbooks or low end laptops may have limited power available for the USB devices. Also Raspberry has such limit - 0.1 A instead of 0.5 A which is the standard. Some network adapters or external hard disks may not work properly under such low power. Then active HUB like this one comes in handy. Power supply gives the power and the computer can use the device. The HUB has one short USB cable which you can connect to the computer. Without connecting it the HUB can be used to power some simple devices (lamps, fans) when connected to the power supply. In such configuration it was able to charge an Android tablet, but iPod reacted only when I connected the HUB to the computer. Radio, wireless keyboard and mouse started working when I re-connected the HUB to the computer once or more times. It may be related to the power used by the LEDs in non-powered HUB. There are red LEDs that may be annoying - a LED for each USB port that glows when the port is on. On the corner there is a small LED that glows when the HUB is in use. When connected to Raspberry it can boot it just with the standard power given on the connection cable, but the most stable config will be when Rasberry is powered by another power supply (HUB gives 0.5A and Raspberry is designed for around 0.7A). In the end the HUB is quite handy, not very expensive and it works.